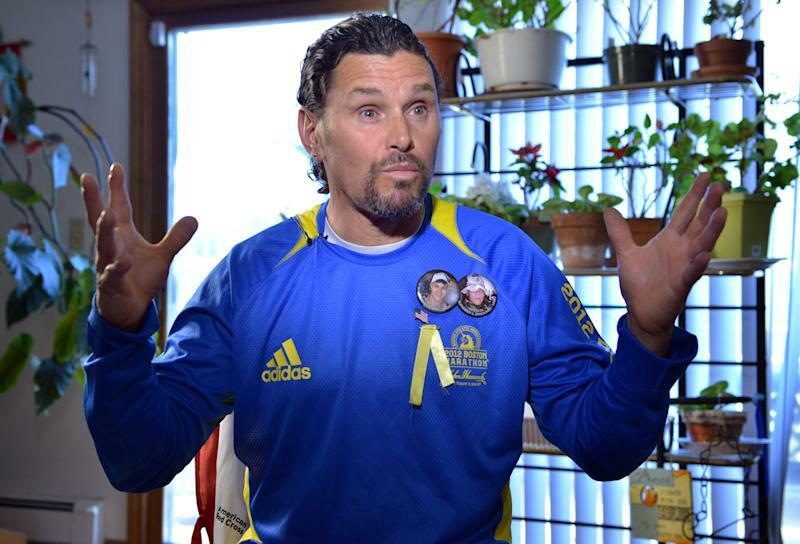 BOSTON (AP) — Just about everyone you can imagine stopped by Carlos Luis Arredondo's little brick row house Wednesday to hear what he had to say about the Boston Marathon bombing. Reporters flew in from as far away as Paris, friends and neighbors strolled in, even two FBI agents made a visit. Virtually overnight, Arredondo has turned into a living reminder of both the horror and bravery witnessed in Monday's double bombing at the finish line of the race. Arredondo, a peace activist and sometime cabbie and truck driver who was watching the race from the finish line, rushed into the mass of mangled humanity, where a dramatic Associated Press photo caught him pushing a wheelchair with a victim who lost most of his lower legs in the attack. "I was in a state of shock briefly, and then I realized I needed to help," Arredondo said in an interview at his home in southwest Boston. He said he had skills needed because he is a Red Cross volunteer trained in first aid. His cowboy hat and riveting comments to reporters, as well as the news photographs of him rescuing bombing victim Jeff Bauman Jr., quickly made him something of a sensation. The stream of reporters looked for the drama in his story, and friends offered words of encouragement. The FBI agents, Arredondo said, asked routine questions in search of mundane facts they hoped would help them solve the extraordinary crime. Could Arredondo and his wife, Melida, verbally retrace their footsteps during the race? Where precisely were they when the bombs went off? What did they see? What did they do? After about 40 minutes of questions, the FBI agents left without talking to reporters. Arredondo said they told him they'd contact him again later. The agents referred reporters' questions to their office, where officials could not be reached for comment late Wednesday. However, Jason Pack, an FBI spokesman in Washington, D.C., said later in an email that the agency "doesn't discuss our investigative activity." Arredondo said Boston police had already stopped by Tuesday and asked for some personal belongings on behalf of the FBI, which is running the investigation. He gave them the shoes, pants and T-shirt he wore at the race, as well as four photographs he took immediately after the attack. He wasn't specific about what investigators hoped to discover from his clothing, saying only that they took some items "they need to evaluate." "We were very happy to help them in any way we can," he added, standing beside his wife. Even before Monday, Arredondo, a U.S. citizen who emigrated from Costa Rica, had lived through more than his share of grief and time in the glare of public spotlight during his 52 years. When, in 2004, several Marines came to his Florida home with news that his older son, Lance Cpl. Alexander Arredondo, had been killed by a sniper in Iraq, the distraught Arredondo smashed the windows of their van, climbed inside and set it on fire. The Marines pulled him out with serious burns, but he later said he set the fire by accident, not to end his own life. In 2011, his younger son, Brian, long addicted and depressed over his brother's death, committed suicide. 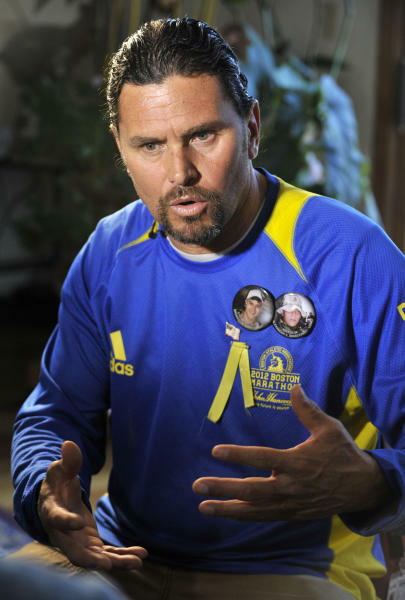 "We both refused to admit that we had mental problems," Carlos Arredondo said at the funeral. According to The Boston Globe, Carlos sought inpatient psychiatric treatment. On Wednesday, reporters sat waiting on benches in a postage-stamp-size memorial garden with a plaque dedicated to his older son. An American flag fluttered in the breeze. Antiwar signs were piled against a fence nearby in this working-class neighborhood of triple-decker houses and towering trees bearing the first buds of spring. Over the years, Arredondo has become involved in antiwar activism and veterans' groups, making him a figure already recognized by many in the Boston area. Now his face, intent on the rescue, is known around the world. Arredondo, who says he went to the marathon to meet with a group of National Guardsmen and military families who were cheering the runners and handing out U.S. flags, spoke Wednesday in a jersey from last year's marathon. On his chest he wore two buttons, each with a photo of one of his sons. He said that two participants in this year's marathon had been taking part in memory of his sons. 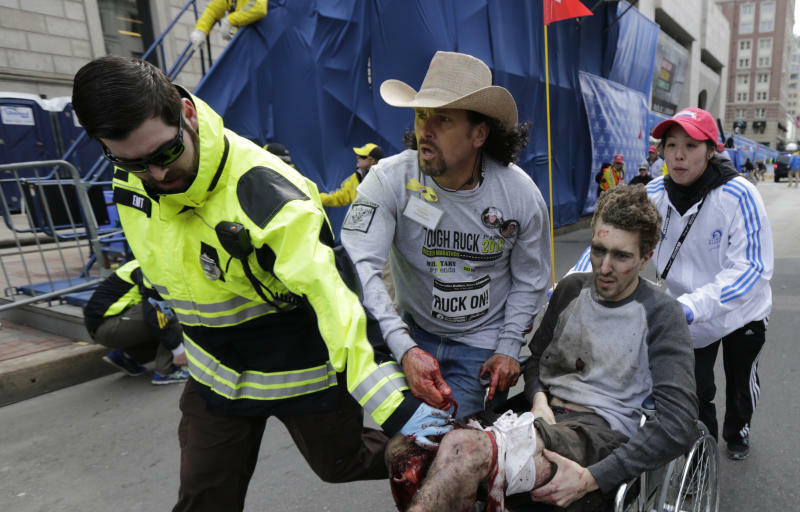 Bauman Jr., the 27-year-old man pictured being pushed by Arredondo, had been at the race to cheer on his girlfriend. "I just can't explain what's wrong with people today, to do this to people," his father, also named Jeff Bauman, wrote in a Facebook post this week. "I'm really starting to lose faith in our country." People who know Arredondo said Wednesday that they were not surprised that he jumped in to help the marathon victims. "He's an incredible guy. He's been through a lot," said neighbor Andrew Burton. He said Arredondo has stayed very outgoing and caring toward others, despite his own ordeals. "He just saw something that needed to be done, and he just did it," said Vietnam veteran Bob Funke, a friend who stopped by to visit. "He's just that kind of person." However, Arredondo did admit to being unnerved by all the attention Wednesday. And he added that he was worried about his own safety and that of others "because we don't know who caused this terrorist attack." The AP National Investigative Team can be reached at investigate(at)ap.org .